And with warmer days making the outdoors a better choice for entertaining, I set this lovely table in my garden with all of you in mind. Honoring all of you who week after week visit my blog and follow me. To thank each and everyone of you who have welcomed me with open arms and hearts. You have embraced my work and my creations and allowed me to come into your homes to inspire you. 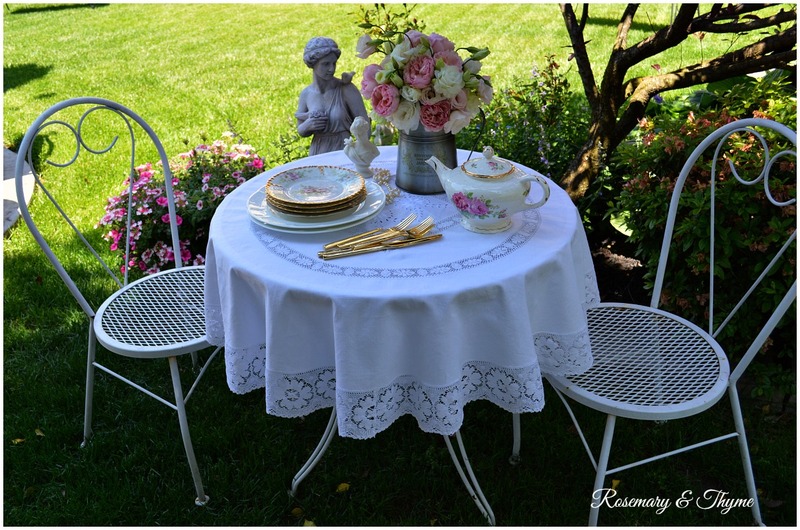 And for that I offer my gratitude and honor you with this romantic and delicate table. My table is begins with a pristine white table cloth. 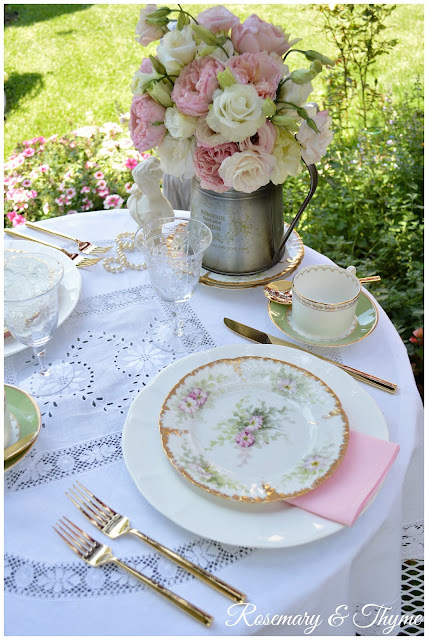 Pretty cottage roses in a casual metal flower pitcher are the inspiration for the colors used on this lovely table. Soft, feminine and graceful. 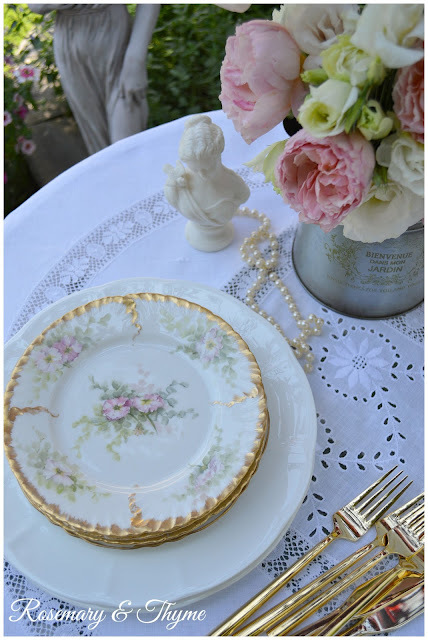 Timeless Limoges salad plates adorned with delicate flowers add a bit of romance to the table. Martha Stewart teacups give a touch elegance while simple gold flatware add a bit of shimmer to the table. 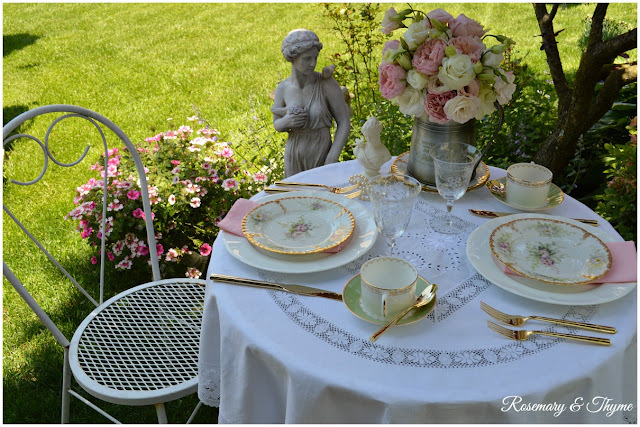 Thank you again for your blog friendship and for the lovely comments you leave with each visit. Beautiful! You are definitely a tablescape artist, Janet! 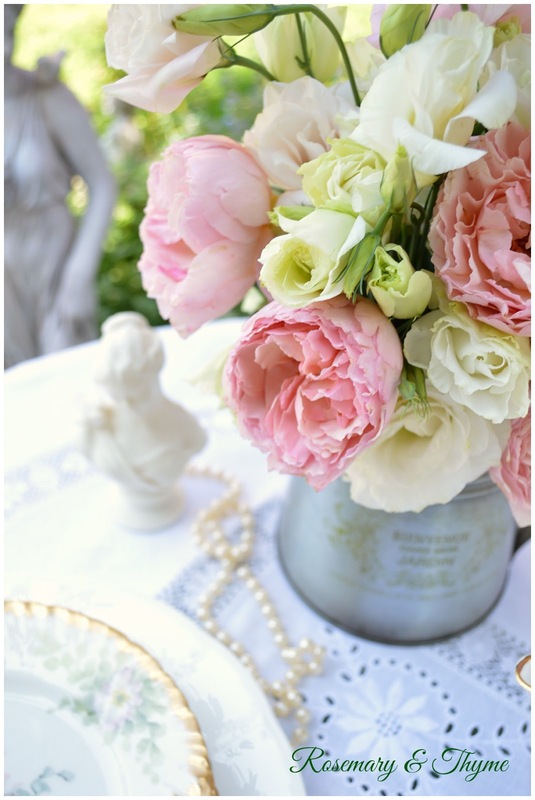 Absolutely stunning - what a gorgeous tablescape! A great meal in a charming setting. It can not board guests and viewers! Thank you Janet for this very pretty table! This is just lovely, Janet! We surely do appreciate your wonderful tablescapes. So much thought and beauty you bring to a table. Thank you for sharing with us and have a lovely day. Lovely! Your china is beautiful. Thanks for linking up to Dishing It! & Digging It! I follow a lot of blogs for what I can learn from them- mostly cardmaking ones and sewing ones. Yours I follow just for my spirit. I have lived with chronic pain for over 20 years and have seen my life turned upside down. Your blog posts bring peace to my spirit and calm the hurt, if even just for a little while. I find myself wishing I were a neighbor who could share your beautiful settings with you over a cup of tea. I once rented an apartment in an 1800s farmhouse and had a patio at my disposal where I was able to have a dark green wrought iron table and chairs. I had tea there at least once a day. Now I share a cup of tea with you while reading your blog posts. Thank you. P.S. 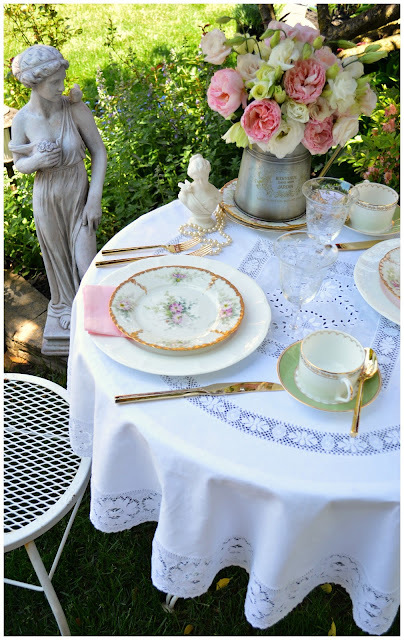 Now I want to do a tablescape outside too! LOL! You set a lovely table and have a truly wonderful setting for it. Hello Janet, I love this beautiful tablescape you set outside! Everything looks so pretty and peaceful! 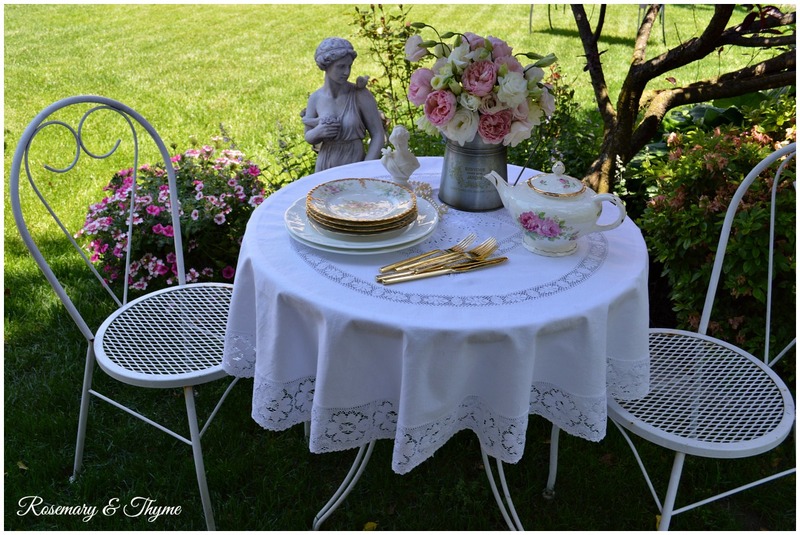 You have set up one of your most beautiful "Tea In The Garden's" yet! I love the way you set the dishes out and all your pretty items displayed. The statue there looks so lovely! Thanks for sharing and linking and I hope you will link this again for my Friday party! 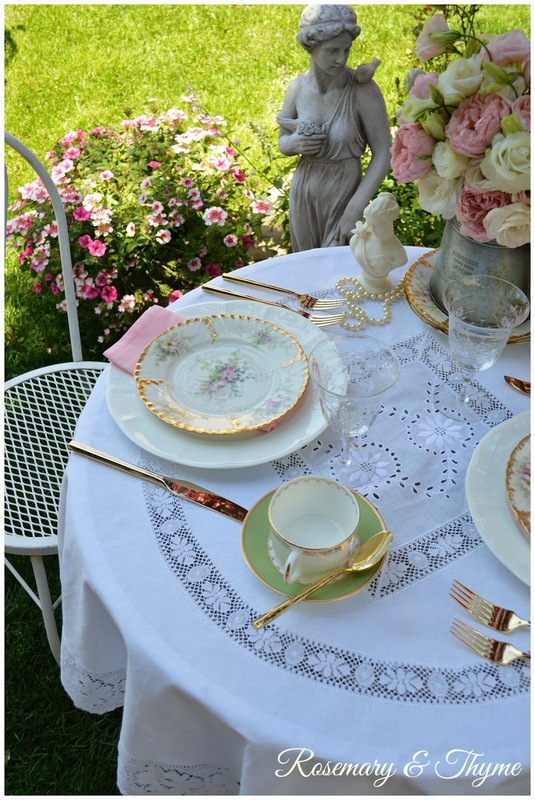 What a beautiful setting, beautiful china, beautiful linens, beautiful everything! I would love to sit at this table! Your setting is just exquisite! You have a wonderful eye for beautiful things!! Just beautiful and tastefully done as always Janet! Thank you for sharing this on the Art of Home-Making Mondays at Strangers & Pilgrims on Earth! 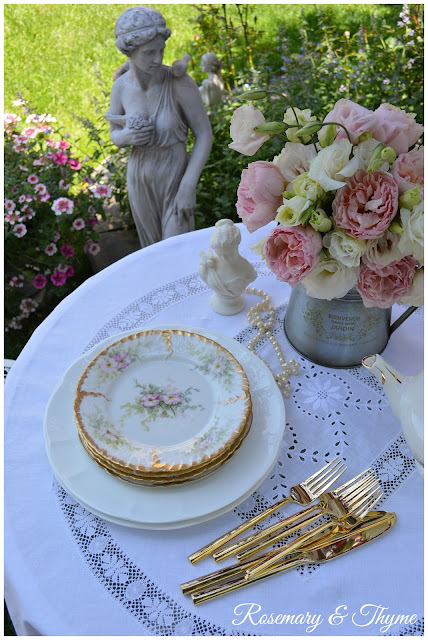 I love it......the bouquet,china and setting are all beautiful! This post was one of the special features today on my blog. 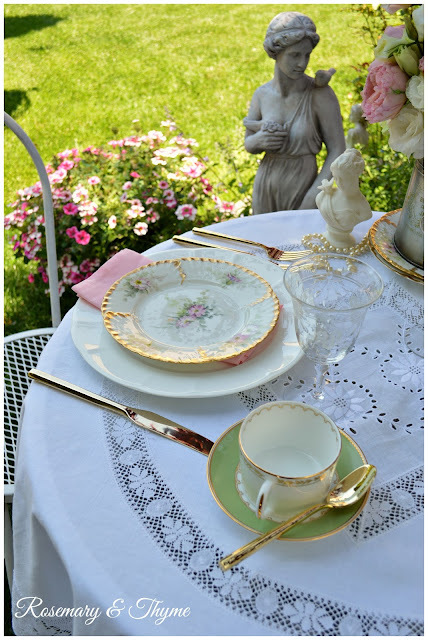 Congratulations Janet and I would love if you would participate in my Friday "Tea In The Garden" parties. Thanks for such loveliness. The flatware is stunning, as is the China. But what really catches my eye are the Peonies and Roses, so lush! What a stunning tea in the garden, my Lovely Lady, I'm charmed more and more by your tablescapes, thank you !!! How romantic and beautiful this is! I will feature it this week at Home Sweet Home! This table is stunning, you have outdid yourself pretty Janet...wow!! I love the gorgeous pristine table linen and the dishes are simply beautiful as well ! I would say it's magazine worth and maybe even better !!! You are a very talented tablescaper, you create such perfect settings and so romantic paired with lovely roses always. Wow Janet, just beautiful! Yes, I would agree with Fabby, it is definitely magazine worthy!